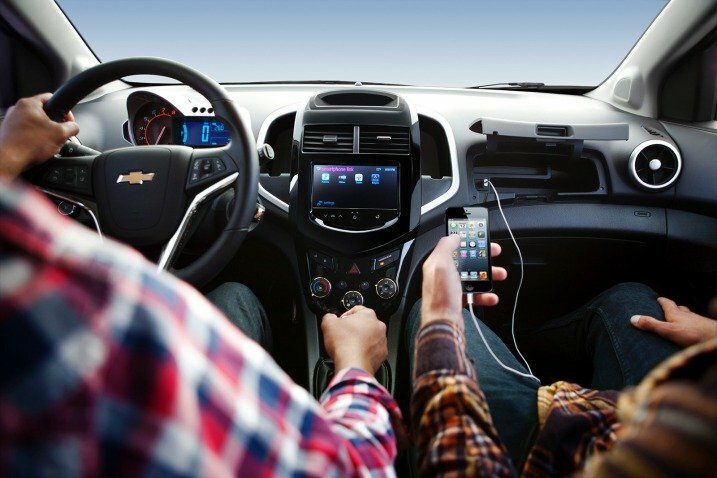 The Chevy MyLink infotainment system is now standard on LT, LTZ and RS trims. A manual transmission is no longer offered on the luxury-themed LTZ. The CD player has been dropped across the board. While its name suggests an ability to break the sound barrier, in reality the 2016 Chevrolet Sonic’s performance is closer to Sega’s zippy blue hedgehog than Chuck Yeager’s Bell X-1. The Sonic is a surprisingly sprightly urban runabout when fitted with the available turbocharged engine and manual transmission. In sporty RS trim, it also remains remarkably well composed when thrown around tight corners. We also like the Sonic’s relatively roomy cabin, which has ample space for tall front seat occupants and more head-, foot- and knee room for rear seat passengers than you might expect. The Sonic is not without its flaws, however. EPA-estimated fuel economy for the base engine is mediocre, and the optional engine, while peppy, takes a few moments for the turbocharger to kick in and provide real acceleration. Interior materials quality is low, even for a segment where ample amounts of hard plastics in the cabin are common. The sport suspension in the RS makes the ride unnecessarily rough and difficult to live with on a day-to-day basis. 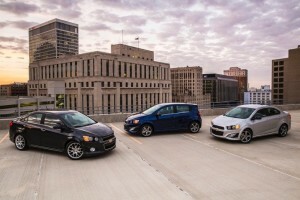 There are a few other subcompacts worth considering. The 2016 Ford Fiesta is one of our favorites, with two fuel-efficient engines and a high-performance ST variant that has more horsepower and superior road handling than the Sonic RS but costs roughly the same. The 2016 Hyundai Accent and related 2016 Kia Rio are stylish alternatives that offer great value and longer warranty coverage periods. You’ll also be wise to check out the redesigned 2016 Honda Fit hatchback, which can’t be beat for superior cargo capacity and versatility. 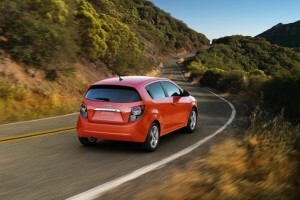 But overall we like the zippy Chevrolet Sonic enough to overlook the majority of its shortcomings. The 2016 Chevrolet Sonic is available in sedan and four-door hatchback body styles. Both can seat five passengers. Four trim levels are available: LS, LT, LTZ and RS. LS models offer 15-inch steel wheels, automatic headlights, manual mirrors with integrated blind-spot coverage, power locks, remote keyless entry, manual windows, air-conditioning, cloth upholstery, a height-adjustable driver seat, 60/40-split-folding rear seatbacks, a tilt-and-telescoping steering wheel, a trip computer, Bluetooth phone connectivity, OnStar telematics (with 4G LTE WiFi) and a four-speaker sound system with an auxiliary audio jack. The LT adds alloy wheels, chrome exterior accents, heated power mirrors, upgraded cloth upholstery, cruise control, power windows, remote ignition (automatic transmission only), a six-speaker sound system, a 7-inch touchscreen interface, satellite radio, smartphone app integration, Bluetooth audio connectivity and a USB port. Moving up to the LTZ gets you the turbocharged engine, 17-inch alloy wheels, a rear spoiler, foglights, additional chrome exterior accents, simulated leather upholstery, heated front seats, a rearview camera and a leather-wrapped steering wheel and shift knob. The RS adds four-wheel disc brakes, a sport body kit, a sport-tuned suspension, unique wheels, sportier exterior trim, leather and simulated suede upholstery and a sport steering wheel. A sunroof is optional for LT, LTZ and RS, as is a Driver Confidence package that adds lane-departure warning and forward collision alert. The LTZ sedan also offers a “Dusk” package that includes 18-inch wheels, four-wheel disc brakes, unique exterior styling, and leather and simulated suede upholstery. The standard engine on 2016 Chevy Sonic LS and LT models is a 1.8-liter four-cylinder that produces 138 horsepower and 125 pound-feet of torque. A five-speed manual transmission with a hill-hold feature is standard, and a six-speed automatic is available as an option. EPA-estimated fuel economy is 30 mpg combined (26 city/35 highway) with the manual transmission and 28 mpg combined (24 city/35 highway) with the automatic: below-average results for the subcompact segment. A turbocharged 1.4-liter four-cylinder is standard on the LTZ and RS (and optional for the LT). Although its 138-hp output mirrors the base engine, it feels more potent thanks to its 148 lb-ft of torque. A six-speed manual transmission is standard for the LT and RS, while a six-speed automatic is optional for those and standard on the LTZ. Fuel economy in the LT trim is rated at 33 mpg combined (29 city/40 highway) with the manual. The LT and LTZ get 31 mpg combined (27 city/37 highway) with the automatic. The RS trim’s sportier gearing results in lower estimates of 30 mpg combined (27/34) with the manual and 28 mpg combined (25/33) with the automatic. In our testing, however, we found that this engine struggled to match those estimates in real-world driving. In Edmunds performance testing, a turbocharged Sonic LTZ hatchback with the manual accelerated from zero to 60 in 8.4 seconds, quick for this segment. Oddly, an RS we tested was slower at 9.0 seconds. Every 2016 Chevrolet Sonic comes standard with traction and stability control along with antilock brakes (front disc/rear drum on the LS, LT and LTZ trim levels and four-wheel discs on the RS and Dusk-package models). There are knee airbags for front seat occupants, side-impact airbags and side curtain airbags. 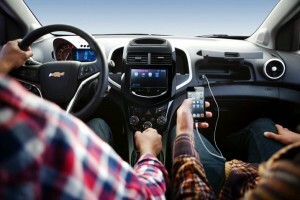 Also standard is OnStar, which includes automatic crash notification, stolen vehicle assistance and remote door unlocking. A rearview camera is standard on LTZ and RS models and available as an option on the LT. The Driver Confidence package includes forward collision warning (alerting the driver to an imminent impact) and lane-departure warning; it’s optional on all but the entry-level LS. In government crash tests, the Sonic sedan received a perfect five-star rating overall, including five stars for total frontal impact safety and five stars for total side impact safety. The Insurance Institute for Highway Safety awarded the Sonic its top score of “Good” in the moderate-overlap frontal-offset, side-impact and roof-strength crash tests, though the Sonic was deemed “Marginal” (second-worst) in the small-overlap frontal-offset crash test. The Sonic’s seat and head restraint design was rated “Good” for whiplash protection in rear impacts. The interior of the Sonic is attractive enough, but the extensive use of hard plastics confirms the car’s economy focus. It earns extra points for comfort, however, as even tall drivers can find a driving position that works. Smaller adults should find the rear seats similarly accommodating by segment standards, with decent amounts of head- and legroom. The Sonic’s gauges and controls are well laid out and easy to operate. Among the more intriguing features is the available MyLink touchscreen interface with voice controls (including Siri Eyes Free for iPhone users) and smartphone integration. MyLink allows you to enjoy Internet radio apps such as Pandora, and you can also add navigation capabilities via the inexpensive “BringGo” app. However, the screen sometimes frustrates with its failure to register touch inputs. The sedan’s 14.9-cubic-foot trunk is among the largest in the segment and can be expanded further with the standard 60/40-split-folding rear seatbacks. The Sonic hatchback offers 19 cubic feet with the rear seats up and 47.7 cubic feet folded down; very good, but bested slightly by the Honda Fit (52.7) and Kia Rio (49.8). On the road, the 2016 Chevrolet Sonic feels more solid and refined than other subcompact sedans and hatchbacks. Similar to the Volkswagen Golf, the Sonic handles well around turns, with notably responsive steering, yet it also rides well enough that long road trips are not an endurance test. Unfortunately, that isn’t true of the RS version. While the sport-tuned suspension sharpens up the car’s handling through turns, it comes at the expense of ride quality. Take the Sonic RS over any pavement rougher than glass and you might momentarily think you’re riding on a wooden roller coaster. Both engines offer decent performance, but the turbocharged 1.4-liter feels more lively and delivers useful power for merging and passing maneuvers. The only downside is the engine’s somewhat sluggish responsiveness, which can make it difficult to accelerate smoothly from a stop in heavy traffic. In addition, efficiency-oriented gearing necessitates frequent shifting in manual-transmission models, because there isn’t much power for passing in 5th and 6th gears. That’s less of a problem in the sporty RS model, as its transmission is geared to provide quicker responses.